Despite these frigid temperatures, the construction crews have been working hard on remodeling the Country Restaurant's kitchen. 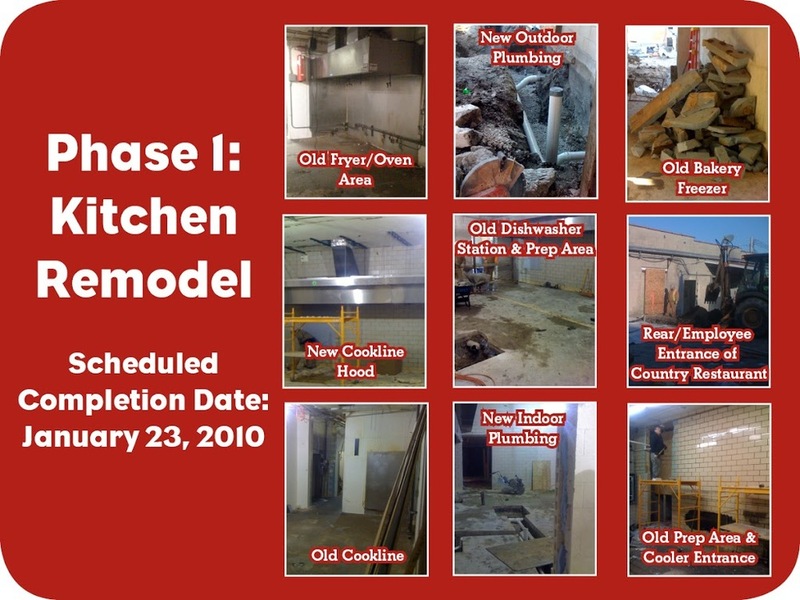 Less than a week ago, it was a fully functional kitchen and even more amazingly, this larger, much more functional kitchen is scheduled to be completed on January 23, 2010, the same day that the Country Restaurant will reopen its doors to the public! To date, the installation of new kitchen power panels and conduit has began, as well as the exterior electrical demolition and installation of drywall. Moving right along, crews began the ductwork, installing the cookline hood, and cutting new openings in some of the masonry walls. We were hoping to have the cooler foundation and slab poured, but this has been inevitably delayed by these freezing temperatures. You don't have to tell us twice... this farm knows all about Mother Nature being the foreman. We will be posting a blog every Wednesday to update you on all the exciting changes taking place on the farm. Make sure to check back or sign up below to receive our postings via email. We also invite you to check our expansion photo albums on our facebook page! As always, we would love to hear your comments or questions about our project.